Make a batch of these spicy Buffalo Tatchos for a delicious snack or game day treat! About 5 minutes before the tater tots are done, melt butter in a small sauce pan over medium heat. Add garlic and saute until fragrant, stirring constantly, about 30 seconds. Stir in hot sauce and sriracha. 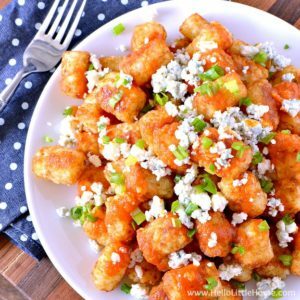 Place tater tots on a large plate, then drizzle with buffalo sauce. Sprinkle with blue cheese and green onions.